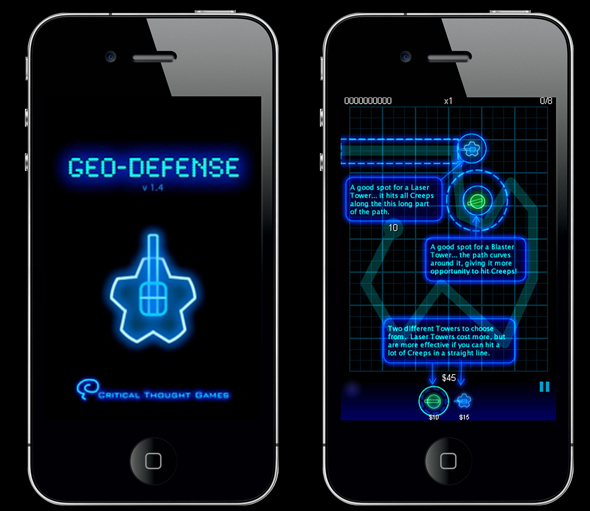 geoDefense is a tower defense game for the iPod and iPhone from Critical Thought Games. As with all Tower Defense style games the objective is to prevent your enemy from reaching your base using the weapons available to you. What really makes geoDefense stand out is the retro inspired neon graphics, and it’s certainly one of the most stylish and best looking games currently available on the iPod and iPhone. But don’t think for one minute that geoDefense is an easy tower defense game like Plants Vs Zombies. Even the medium difficulty levels present a serious challenge which will require multiple attempts to complete. However, the game never becomes frustrating, and you keep coming back for just one more go to beat that level. My only reservation is that geoDefense only gives the player a choice of 5 different units with which to defeat your enemy. This keeps the game simple, but a wider selection of units, as per Plants Vs Zombies which has over 40 different plants, would have provided more variety. Critical Thought Games have already relesed a sequel to geoDefense, called geoDefense Swarm. The main change being that geoDefense Swarm features open areas rather than pre-defined routes, adding a new element to the game play. 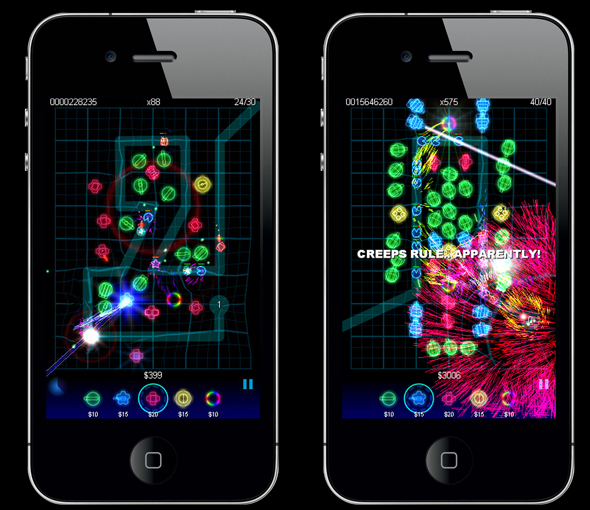 A HD version of geoDefense is in development for the iPad and is expected to be released to coincide with the launch of the Apple iPad 2 in spring 2011. A stylish and challenging game that no iPod or iPhone owner should be without.